Please verify your vehicle color code prior to ordering. Paint sprayers make touchup easy! Get 25% off a Preval Sprayer (when you buy one or more Toyota 1/2 oz. tubes). Simply enter coupon code "pt111" at checkout!! Touch-up paint is available as an alternative to expensive professional body shop paint repair. To achieve factory or body shop quality results please consult with a professional body & paint specialist. Brandsport cannot guarantee results. We recommend testing in an inconspicuous area first. See all Toyota Touch Up Paint colors. Don't forget our matching Door Edge Guards, Fender Trim & more. Are you looking to cover those unsightly scuffs or scratches on your Toyota? Well, save time and money now and grab this tube of quality factory Toyota Touch Up Paint in your original Toyota color here and avoid a potential rust problem. This is the Genuine Toyota factory touch up paint that matches your original color code, although it is important to first try the paint in an inconspicuous area to ensure you are using the correct paint color and to allow for paint fading and aging that happens over time. Each tube includes four great features to make the application quick and easy. 1) There is an agitator ball inside each tube to mix the paint thoroughly and it is recommended that you shake the tube for at least 20 seconds before application. 2) The snap-off cap features an abrasive tip extension that you can use to remove small rust spots and prepare the surface for primer and paint. 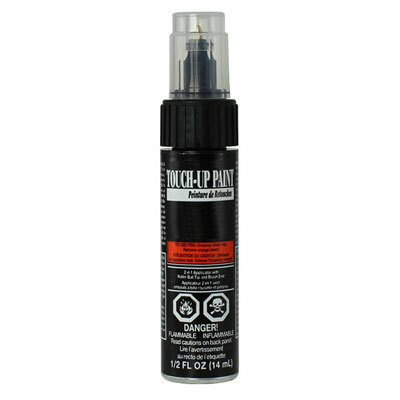 3) On the outside of the threaded cap you will find a built-in pen tip for touching up the smallest of fine scratches. 4) And finally, on the underside of the threaded cap there is an attached brush applicator to make your touch up job a snap. Toyota also recommends cleaning the surface with an alcohol wipe to remove any oil and debris before applying any paint. So you can rest assured, this Toyota Touch Up Paint blocks further paint surface rust and corrosion, and will leave your Toyota with a clean and fresh look.